The dazzling sustainability metal waste bins that litter Sheridan’s Trafalgar Campus grounds illustrate what appears to be the Emerald City of environmentalism. But the college administration’s style-over-substance approach to some of the most important decisions an institution can make is the same sort of thinking that landed our planet in this environmental mess. 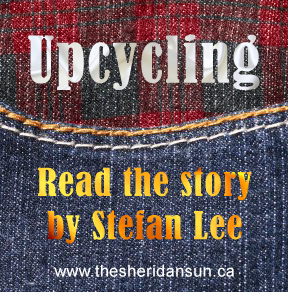 Have you heard Sheridan has new recycling bins? That’s right: recycling bins. Unless I recently fell into a time-travelling coma and woke up in 1992, I fail to see why the college suddenly thinks recycling is a selling point for students. It’s absolutely shameful a proper recycling system hasn’t been in place for decades. Although Sheridan has had blue bins in some classes and offices for years, the waste would all end up in a landfill along with the rest of the college’s garbage until this year’s rollout of Sheridan’s Zero Waste program, according to Sheridan’s president Jeff Zabudsky. Countless students and faculty at Sheridan have grown up with the three R’s and Earth Day as facts of life. Although, to a faculty member who has been taking her recycling home for the last six years to properly dispose of it because she couldn’t at work, I suppose the big announcement is welcome news. Sheridan’s sustainability movement has largely been a cost-savings program that streamlines energy systems. But to effect any meaningful change to our planet, a “cultural shift” is required, according to Herbert Sinnock, Sheridan’s sustainable energy systems manager. Such a shift will only come by practising good examples in sustainable living, he says. Sinnock sees sustainability as living in a way that doesn’t impede the progress or prosperity of future generations, whether by environmental, social or economic means. Sheridan’s Office for Sustainability, formed in 2010, was one of Zabudsky’s first claims to fame after coming to Sheridan earlier that year. He helped organize the annual President’s Creative Challenges, which use student talent to brainstorm solutions to complex issues faced by society. The first challenge was focused on sustainability-minded ideas for the college to implement, and the metal waste bins around Trafalgar Campus are used to promote the office’s website. The website was never updated with information on the winners, despite a total of five pitches being declared winners instead of the originally intended one. This is just one example in a list of failed opportunities Sheridan’s administrators and its Board of Governors had to make Sheridan stand apart not just from other colleges, but to set an example for its students and the surrounding community in sustainable living. enabled generations before ours to let things get so out of hand on our planet. Another failed opportunity is Trafalgar’s new residence, which the Office for Sustainability had little input on despite being in operation years before ground was broken on the project. What better way could an institution promote sustainably-minded living than by providing a cutting-edge example of what’s possible in the home of many students who are living away from their own for the first time? Instead, as with most dollar-driven decisions, the residence was outsourced to, hastily constructed and managed by a third-party company called Campus Living Centres. The Jeeps Sheridan’s security recently purchased was also “a decision that did not cross our desk,” said Sinnock. Interestingly, Zabudsky mused that the reasoning behind purchasing those vehicles was due to their all-terrain prowess in patrolling the woods around Sheridan. But as the assaults this February have shown, those Jeeps go nowhere near the woods themselves, and instead, a smaller all-terrain vehicle was purchased to traverse the trails. It’s difficult to paint yourself as an eco-friendly school when you’ve got gas-guzzlers endlessly idling and patrolling the campus, chosen for little reason other than how serious they look. And perhaps, most glaringly of all, Sheridan still offers little student engagement in helping promote and practise changes in student and faculty lifestyle. Elaine Hanson, ex-director of the Office for Sustainability, had made this one of her top priorities before she was eliminated over the Christmas break. Hanson was laid off due to restructuring, according to Andre Plante, Sheridan’s associate vice president of finance and administration. Plante has assumed Hanson’s workload for the time being. Aside from the formation of any student groups, the hiring of three co-op students to help perform an assessment of Sheridan’s sustainability efforts is now on hold until at least the spring. This, as anyone knows, is when the vast majority of students leave the college until the fall or for good. When I asked a dozen Sheridan students about the college’s lack of student engagement in such an important global issue, no one put it better than Jessica Martens, an 18-year-old Media Fundamentals student. “When I think of extra-curricular clubs, that’s usually one of the first ones I think of,” she said. It surprised her to hear there weren’t similar student groups at Sheridan. But should students be so surprised? The “green image” has long been used as a means of attracting customers to brands whose leaders seem to have little sense of the problems at hand. A prime example of such senselessness would be Zabudsky’s suggestion that economies such as China or India deserve their own industrial revolutions. Sorry Jeff, but I don’t think ol’ Terra Firma has it in her for one or two more industrial revolutions. This sort of short-sighted and downright dangerous leadership is what has enabled generations before ours to let things get so out of hand on our planet. As any reputable geologist will tell you, the time for passing the buck is coming to a close, if it’s not already too late. When you’ve got money-over-matter driving policy, you get what Sheridan’s getting: improvements to energy systems that will help offset the ever-increasing tuition rate from rising faster in the future, but without any meaningful attitudinal shift among the people using those systems and paying those rates. Oh, and some more fancy waste bins. Click here to view Sheridan’s most recent report (July 2012) on its sustainability efforts. Added by Chris Coutts on March 7, 2014. Since science can’t agree beyond; “could be”, you remaining “believers” can’t “believe” it WILL be. WANTING this misery to have been real for billions of children is a pure war crime for history to judge.